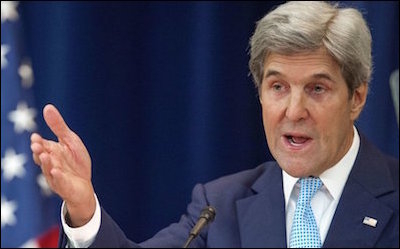 Secretary of State John Kerry condemned Israel for settlement policies that "make two states impossible" on December 28. United Nations Security Council Resolution 2334, which describes Israel's settlements in the West Bank and East Jerusalem as illegal, should never have passed last week. But the U.S. refused to use its veto power, in part because, as Secretary of State John F. Kerry explained in a speech on Wednesday, the Obama administration believes settlements are an obstacle to peace in the Middle East. In the outgoing administration's view, extreme criticism is, conversely, necessary to advance the peace process. This argument is dead wrong. Still, let's examine it. The main impediment to compromise is Palestinian unwillingness to accept the existence of a Jewish state. The main impediment to Palestinian compromise is not Palestinian suspicion; it is the fundamental unwillingness of Palestinian leaders across the spectrum to accept the existence of a Jewish state alongside their own. Some settlement growth makes it easier for Palestinian moderates to build public support for compromise. What's more, a strong case can be made that some settlement growth actually makes it easier for Palestinian moderates to build public support for compromise by underscoring that a continuation of the status quo is untenable and injurious to Palestinian national aspirations in the long run. The Obama administration's second assumption is that pressure from the international community or from the United States will bring about this supposedly desirable settlement freeze. However, by collapsing the distinction between East Jerusalem and bustling Israeli towns just inside the West Bank — which no major Israeli political party will contemplate abandoning — and the remaining settlements, most of which Israelis are willing to give up, this policy does the opposite. "It is a gift to Bibi Netanyahu, who can now more easily argue to Israelis that the bad relationship with America these last eight years wasn't his fault," notes the writer Jonah Goldberg. Finally, even if it were true that a settlement freeze would make it easier for Palestinian negotiators to trust Israel and that international pressure would increase the willingness of Israeli leaders to accept such a freeze, these effects would be far overshadowed by the problems created by branding Israeli claims outside the 1949 armistice line illegal and invalid. Palestinian leaders will have double the trouble compromising now that the UN has endorsed their maximalist demands. Since Palestinian leaders already have trouble justifying to their people the abandonment of territorial claims to Ma'ale Adumim, the Jewish quarter in Jerusalem, and so forth, they will have double the trouble now that the United States has endorsed these demands. What Palestinian leader can sign away territory to which Washington and the Security Council have declared Israelis have no legitimate claim? Kerry stated plainly that Israel is to blame for the demise of the two-state process, and that — unless its leaders listen to counsel — Israel will not survive as both a Jewish and a democratic state. Now that the administration's views are crystal clear, pundits should spare us the back and forth on whether its eleventh-hour obsessions are good for peace – no one as smart as Obama or Kerry can possibly believe that it is. The more interesting question, sure to be the focus of congressional hearings next year, is why the administration used its last few weeks to damage relations with Israel.